In French, to preserve the soft c in front of vowels a/o/u, we use ç. 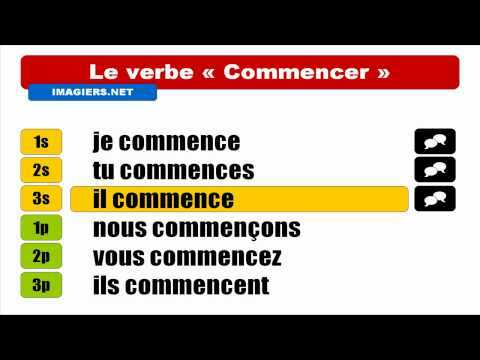 This rule applies to verbs ending in -cer when they are conjugated. À quelle heure tu commences ? Mon fils pince souvent sa sœur. My son often pinches his sister. Comment placez-vous vos invités ? How are you seating your guests? Ils sucent encore leur pouce. They're still sucking their thumbs. Nous commençons à apprendre le français. We begin to learn French. What does je puis mean? Je peux. -- I can (the verb is an irregular from of pouvoir). Puis-je vous aider? -- Can I help you? You might think it ought to be peux-je and not puis-je but that's where French is throwing yo a curve ball. That's just an exception you have to memorize. "Je parle au nom des 27 chefs d'Etat et de gouvernement, si je puis dire aussi au nom du Parlement européen, il y a unanimité du côté de l'UE pour que dans l'accord de retrait que je dois mettre sur la table (...) il y ait un règlement sérieux avec les Britanniques"
Here is what my French go-to native speaker says: "Jamais dans la vie courante. C'est d'un style très littéraire, ou ancien." Je puis is certainly not incorrect and as you pointed out 'si je puis dire' is a very common expression. I had a look through my electronic copy of "Le petit prince" by Antoine de Saint-Exupéry and every one of the numerous instances of 'I can' is rendered as 'Je puis' and none as 'Je peux'. This novella, voted the most popular book of the 20th century, with a recommended reading age starting from 9 years, can hardly be deemed either supremely literary or archaic. Je puis is very formal and can sound pompous, you might hear it said between friends for comical effects. In some shops, someone might ask you "Puis-je vous aider?" which is the very formal way of adressing customers like, "Que puis-je faire pour vous?". Est-ce que je peux vous/t'aider? Quest-ce que je peux faire pour vous/toi?